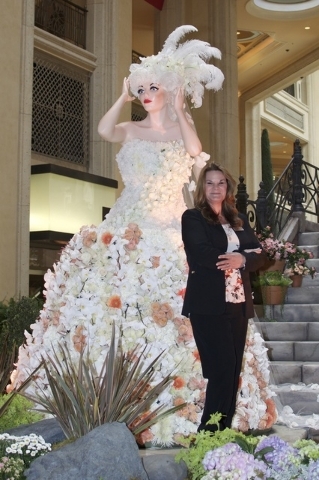 Dana Beatty came to The Venetian as a floral designer before The Palazzo opened. Now, as director of floral and horticulture, she’s in charge of the ‘theme-scaping’ that provides a seasonal wow for visitors. The cycle begins with Chinese New Year, which is “a very big celebration for our guests.” Then the displays transition by season: spring, summer, fall, winter. Beatty came up with the latest display idea herself. The Waterfall Atrium and Gardens of The Palazzo Las Vegas were transformed into a Celebration of Carnivale Di Venezia, which runs through Sept. 1. Q. Where did you get the idea for this particular display? A. I get these ideas from random places. This inspiration was looking through books about Venice. Drawing as much inspiration as I can from the different elements of the decor. I started to notice with the Carnivale celebration that these women are amazingly dressed with elaborate gowns, elaborate masks, elaborate hair, and so I thought this could be really challenging but amazing to do in our medium. Q. What goes into a production like this? A. We actually started working on this particular change out two years ago. Countless man hours. I could only even image how many. A lot of it started with the research. Once I developed a concept that I thought would work in the space, the challenging aspect of this area is that we also share the space with the mall that’s on the second level. So I always want to try to be sensitive to what they want to see as well. I thought this is more fashion forward, so I met with a couple of the retailers that we partner with and … they loved it. So I said OK, I’ve got the support of our senior management, our partners, and just kind of rolled with it. Once that was established — that I think that it is a show that would be successful — we start concept boards, renderings, and start to develop it from there. Q. What is the major challenge of getting this type of project up and on time? A. We are limited on our space, and since we have retailers that open at 9 a.m., we have to start at a certain time at night. We start at about 11 o’clock at night when all the retailers shut down. We have to rope off the area, so it presents some challenges with our guests. We’re always very conscious of impacting their experience. This particular show we actually put up a black pipe and drape because the Venetian women took a couple nights to install, and we wanted to do an unveiling. We didn’t want them to see a woman with a dress and no head; we wanted them to be complete. Sometimes that’s a challenge; we can’t do it all in one night. I wish we could, but we can’t. Q. What is the competition like among resorts? A. It’s more curiosity than competitive when I really think about it. It’s entertaining to see what plant material they chose or trying to determine if they used expert advice on Feng shui or not. But at the end of the day, it’s friendly admiration. Q. How many cut flowers are used? A. The Venetian Women are all made out of fresh-cut flowers. There’s about 3,000 to 3,500 on each one of the women, depending on which one it is. We have one that’s Bohemian inspired … it’s all baby’s breath, and I have no idea how much baby’s breath we used. We used a ton … I think we used like 400 bunches. Q. Where do you get the materials you need? A. Everything is living … we do have refrigerated space … but the women are the only … fresh-cut flowers, and then the plants surrounding them are all living plants. Q. How much use do you get out of the plants? A. Actually, we get about three weeks out of them. And then we have an amazing sustainability program here. When the plants are pulled out, we do a team member sale and allow our team members to purchase them at a reduced rate, take them home and enjoy them for a couple more weeks until they’re gone. Q. Where are the plants and flowers from, and what is the significance? A. We choose flowers that you would see strolling down an Italian courtyard or side street. We have hydrangeas; we’ve got chrysanthemums; we’ve got the spiral Italian cypresses. Some are chosen for longevity, some are chosen for color. Our color palettes are going to rotate three different times during this show. The first part of it is wedding-inspired, so we wanted to do soft pastels. We chose the flowers to the color palette. We’re going to do three transitional changes … which is a first for us. The first week in July, we’re going to transition to a hot summer night color. We’re doing hot pink and purple and chartreuse and really vibrant, warm colors. The style of the dresses is going to change. The first week in August we’re going to transition into a soft fall. We’re not going to go hard autumn colors. We’re going to go more bolds —browns, more warmer reds — and that’s actually the one I’m excited for because I’m a fall person.